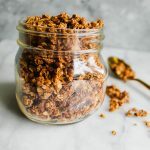 This Maple French Toast Granola is loaded with flavors you find in your favorite French toast breakfast! Made with only a few ingredients like rolled oats, butter, cinnamon and of course – pure maple syrup! Best on yogurt, with milk or just eaten as a snack! There is no question that I love carbs. Seriously, I eat many forms of carbs for each meal. When the cool weather comes around, I love love making warm oatmeal. It’s pure coziness in a bowl. Add some heavy cream and you’re set. However, sometimes it’s hard for me to eat something like oatmeal over and over. Yes, it tastes amazing and is good for me…but sometimes it tastes like flavored mush. That’s why I love adding some extra crunch on top. 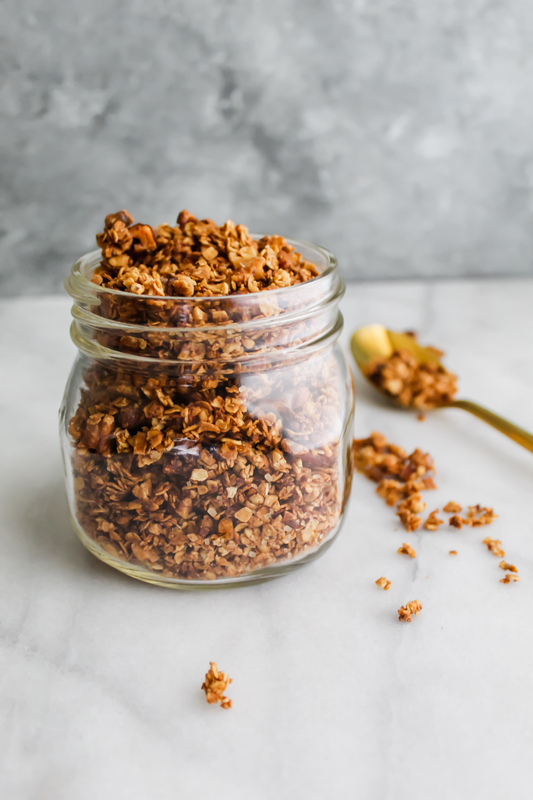 Like this Maple French Toast Granola! 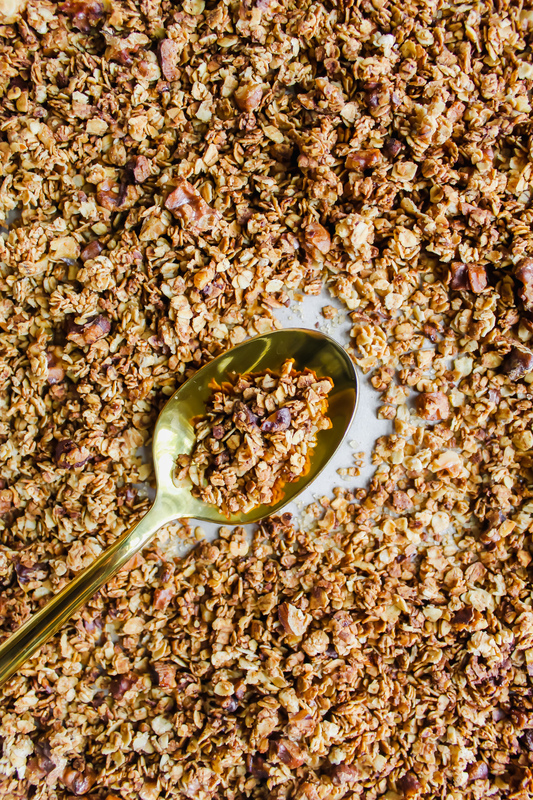 This Maple French Toast Granola is literally the crunchiest, most flavorful delicious granola! It has the best French Toast flavors. It’s loaded with pure maple syrup, made with butter (because who doesn’t put some type of butter on their french toast?! ), cinnamon and vanilla extract! 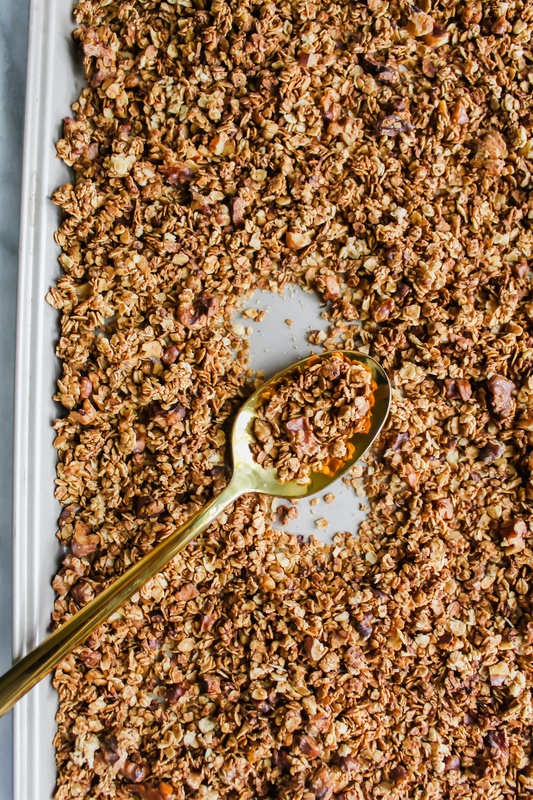 Basically, it’s all of the cozy flavors of Fall on one sheet pan of granola. Truly wonderful. I love using the butter instead of coconut oil or ghee like I have used in the past in granolas like my Chunky Coconut Granola or my Holiday Spice Granola! The butter adds a delicious saltiness to the granola. Also, just real talk for a moment: Why does anyone use unsalted butter for any reason ever?! Salted butter is LYFE. 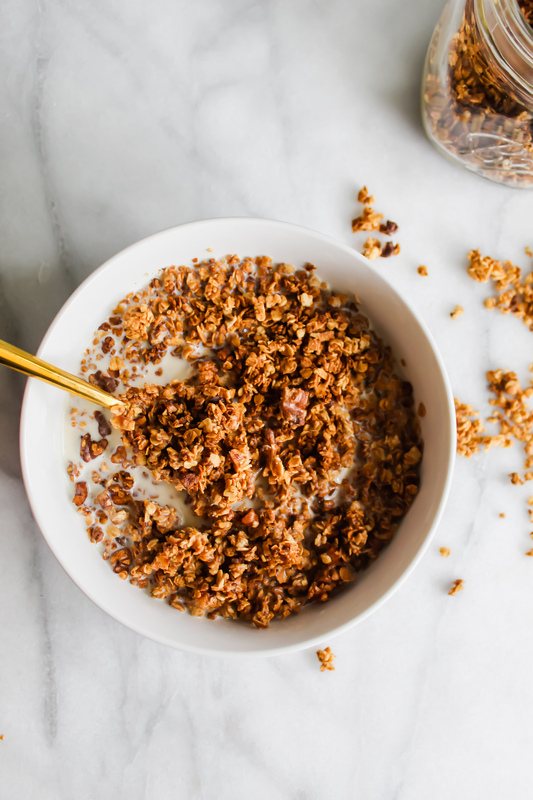 The real maple syrup is also essential in this granola. You really need it for those french toast vibes. If you’re feeling extra maple-y, you should try and add some maple extract in place of the vanilla! Let’s get into how to make this super easy Fall breakfast! It’s basically the easiest thing ever. First, of course you must preheat your oven! Combine your oats, maple syrup, melted butter, vanilla extract and cinnamon in a large bowl. You can also add chopped walnuts for an extra crunch and some coconut sugar for some extra sweetness. Make sure it’s ALL mixed together and coated equally. Spread it out on a baking sheet. Let it bake for about 20 minutes or so. Don’t shake it around – this will break up the chunks. Once 20 minutes is up, I turned up the heat for an additional 5 minutes just to get some extra color and crunch. Yogurt! My favorite is full fat plain greek yogurt. Milk! Both non-dairy milk or full fat whole milk work amazingly. I especially love it with whole milk because it makes it so rich and creamy and the milk has such a maple flavor. As a snack! Honestly just a handful of this every few hours would be an amazing snack to give some energy! Hope you guys enjoy this extra easy, extra delicious Maple French Toast Granola. I love the extra maple flavor and the butter, the cinnamon and the vanilla extract truly give it such a cozy taste. The french toast flavors will make you feel like you’re at an awesome brunch on the weekend. Minus the mimosas. Enjoy this one, y’all! This Maple French Toast Granola is loaded with flavors you find in your favorite French toast breakfast! Made with only a few ingredients like rolled oats, butter, cinnamon and of course - pure maple syrup! Best on yogurt, with milk or just eaten as a snack! Preheat your oven to 300 degrees. Combine the oats, maple syrup, vanilla extract, cinnamon in a bowl. Add in your melted butter and combine until it is all coated evenly. Spread it evenly onto a baking sheet. Bake for 20 minutes. Crank up the heat to 325 degrees. Cook for an additional 3-5 minutes or until toasted golden. Let it cool on the baking sheet and then break into chunks. Store in a glass jar or glass tupperware. Enjoy with yogurt, oatmeal, milk or just as a snack! I tested this recipe with both quick oats and old fashioned rolled oats. I preferred the thickness of the old fashioned oats - but both technically worked! 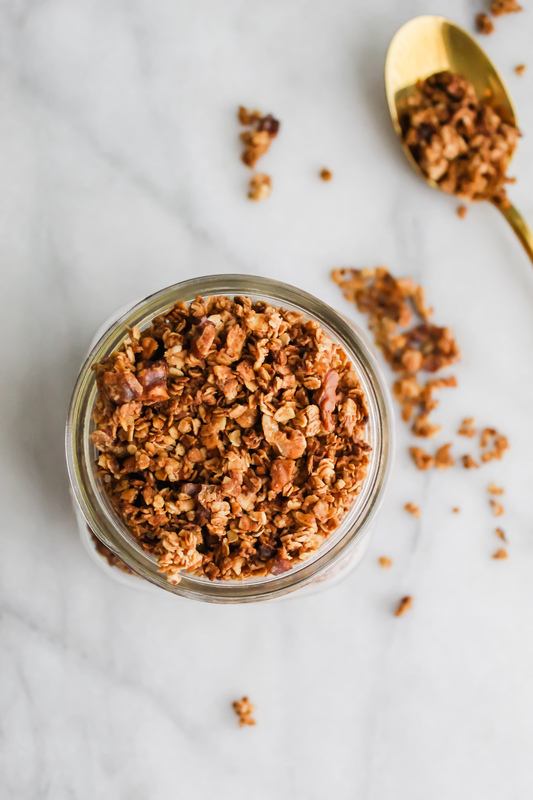 Just shared this awesome granola and will be on my list to make. I agree that butter is the way to go as well. Yay! Thanks, James! You rock. Butter all the way! !